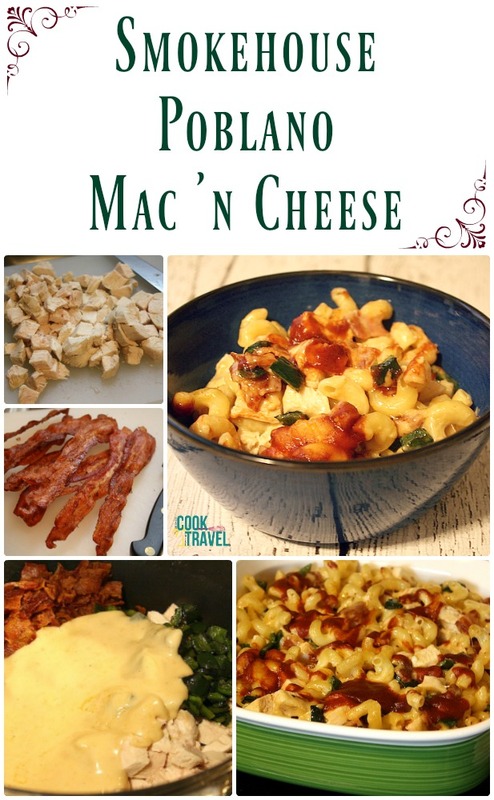 You are here: Home / Blog / Main Dishes / Smokehouse Mac ’n Cheese = BBQ Heaven!! Smokehouse Mac ’n Cheese = BBQ Heaven!! Happy Friday! Please tell me I’m not the only one who has had a crazy work week! Every day starts and it’s either already packed with calls or soon will be. So my time after 5pm has become pretty darned precious lately. And when it came to what I wanted to cook this week, I just wanted to get in the kitchen and make comfort food (despite the crazy heat here in Kansas City!). And Smokehouse Mac ’n Cheese was EXACTLY what I needed! It should be fairly obvious from Wednesday’s post that I’m a connoisseur of macaroni and cheese. I love to eat it when I’m out and I enjoy making it at home too. And most recently I was on a date a few weeks back and we went to a tapas restaurant in KC,MO. When I spotted the mac ’n cheese on the menu I couldn’t see anything else. Must. Have. Mac ’n Cheese! It was a slightly fancy dish with poblano peppers and was nice and cheesy (and delicious). And when I found a recipe for Smokehouse Mac ’n Cheese, all my culinary brain could do was insist that I merge the 2 dishes together. Oh holy moly, my spin on this Smokehouse Mac ’n Cheese was AMAZING! So here’s how it goes. Pick your favorite pasta. I love a good cavatappi, mainly because it’s tubular like macaroni, but it’s longer with more of a curl, so it’s a bit more wild. (Yes, I really do think about my pasta like this when selecting it!) And since I was inspired with the poblano at the tapas place, I had to include a poblano pepper here for a mild heat. The smokehouse part comes into the picture with a nice, smoky bacon flavor. Then add in some chipotle chili pepper and smoked paprika. 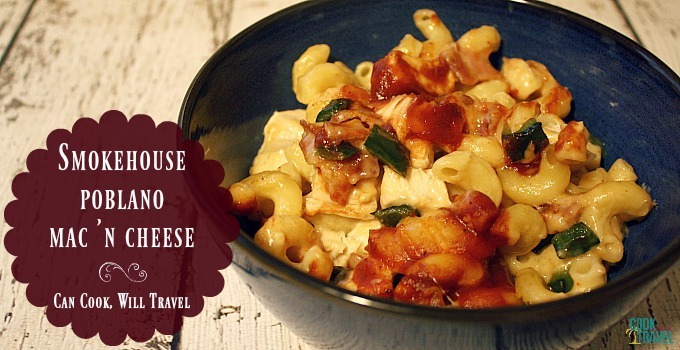 The cheese sauce also has a great smoky flavor since it’s packed with smoked cheddar cheese. And then you top it with your favorite BBQ Sauce. Since I have been enjoying the past couple of weeks back in KC full time, it totally made sense to pick this recipe. After all, Kansas City is absolutely known for its BBQ. And you ask any Kansas Citian and they will happily tell you their favorite BBQ place. (Oklahoma Joe’s has been a favorite of mine for a while, but there are a few more I must try soon. Q39, I’m looking at you!) And of course, my BBQ sauce had to be a local brand. So I used Jackstack BBQ sauce, and it added the perfect smoky sweetness to the mac ’n cheese. So cook your pasta. You’ll also cook your bacon and chicken. I prefer to cook my bacon in the NuWave or bake it in the oven to drain off as much fat as possible. And I also opted to poach my chicken for SO many reasons – including less time spent handling raw chicken, super easy and clean to do, there’s no extra oil, and the chicken is really juicy. With all of the flavors going in, there was no need to add extra bacon grease or oil to the protein. Then make your cheese sauce. I love adding lots of flavor to my cheese sauce, so spice is a must. To this smoky cheddar cheese sauce, I added chipotle chili pepper, smoked paprika (to go with the smoky theme), and ground mustard. From the ooey gooey cheese sauce, to the fun pasta, flavorful meat, and slight spice from the poblano peppers . . . well, this dish was insanely good. No really, it was delightful! I baked it in the oven to heat it through, and topped it with a little BBQ sauce for a slightly sweet and tangy touch. So flipping good! I can make a meal of this dish or it’s the perfect side to your next BBQ! Feel free to take out the chicken and bacon if you want to use this as a side. 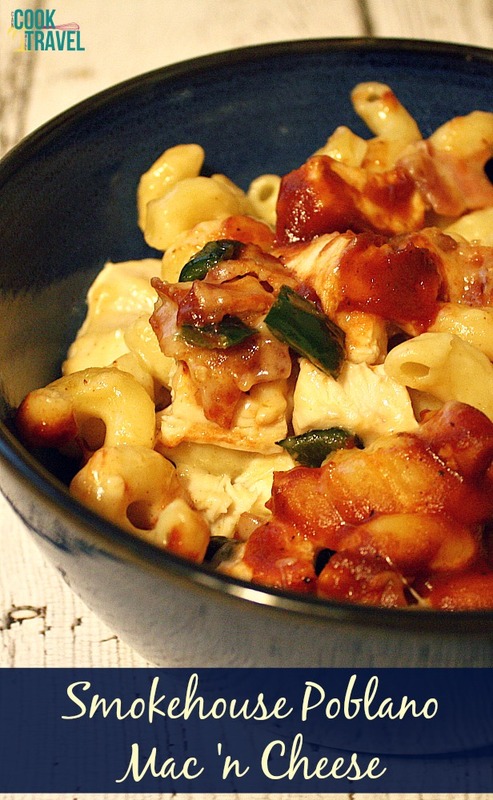 To say I can’t wait for you to whip up this Smokehouse Mac ’n Cheese is an understatement. Please click that link for the recipe and step by step instructions . . . ASAP! Happy mac ’n cheesing!! Two years ago: Pumpkin Waffles – Welcome Back Fall! Five years ago: Hooray for Stuffed Shells!